Easter Bank Holiday is a great weekend that often includes an over indulgence in eating sweets and big Sunday dinners. But unfortunately there are many incidences that also occur during this religious holiday that are sombering. Here is a brief recap of accidents and deaths that have occurred over the Easter weekend. On a light note, many people enjoyed one too many easter eggs which led to an overload of A&E patients at James Cook University Hospital in Middlesbrough who had stomach aches. The NHS bosses told people on Facebook to “rest at home and drink plenty of water”. Thankfully these patients didn’t suffer from anything serious but just need to work on self-control. In a town in Guatemala, locals were re-enacting the Passion of the Christ during the Easter celebrations. This was complete with a man tied to a cross which people were carrying. Unfortunately the people carrying the cross were a little imbalanced and the cross tipped to one side where the man then fell 10 metres to the ground. It is still unknown if he received any major injuries. On a much more sombering note, the Easter celebrations of Thurston Fun Fairs in Harlow Town Park in Essex was well underway when a bouncy castle was lifted off the ground and blew about 150 metres. Unfortunately 7-year old Summer Grant was inside and was killed. 2 people were arrested on manslaughter by gross negligence. 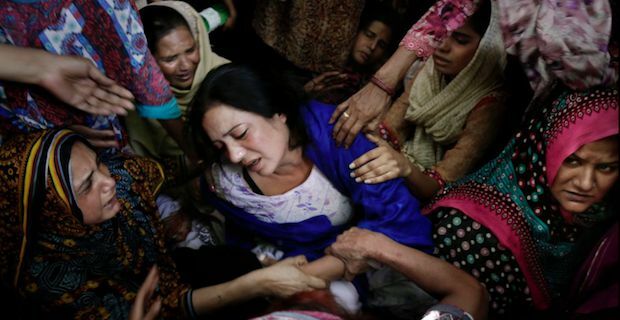 Another tragic event over Easter was the suicide bombing that took place in a public park in Lahore, Pakistan. While Christians were gathered in Gulshan-e-Iqbal Park, a member of the Islamic militant killed over 70 people and injured around 300 with his suicide bomb that was packed with ball bearings. So while the Easter weekend may have been full of great easter egg hunts and stuffed bunny rabbits, it is important to remember those that have also lost their lives based on what they believe and those that were simply in the wrong place at the wrong time.